First, the students and I played a quick round of two truths and a lie as a small icebreaker. For example, I made these three statements about myself. 1) I graduated from the University of Illinois. 2) I played the oboe in high school. 3) I lived in Hawaii for a year. Then I gave each set of partners a copy of the Two Truths and a Lie form. 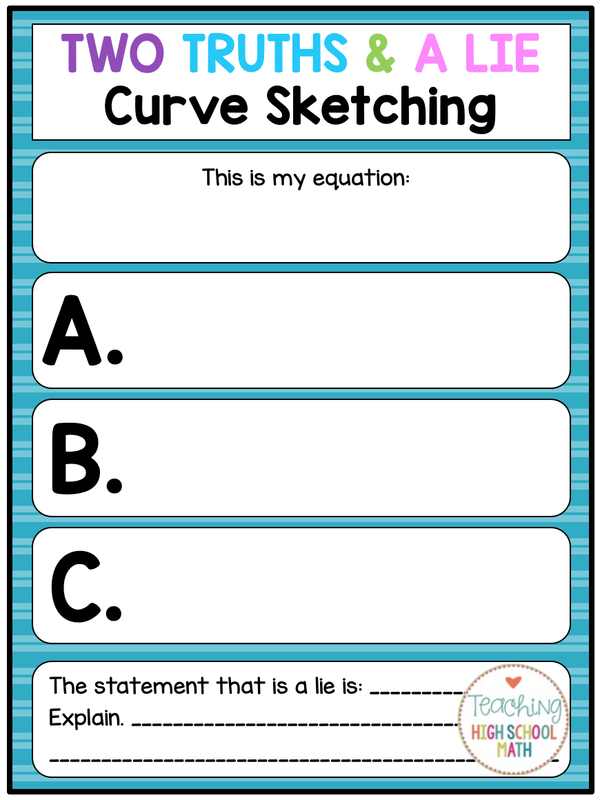 Students could do this activity by themselves, but I thought for a first effort maybe partners would work better. 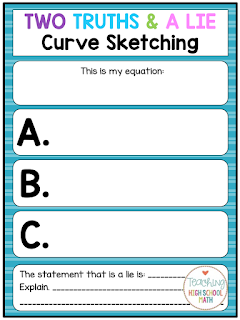 This form is specifically geared toward this particular Curve Sketching activity, but it could easily be changed to target whatever topic you want. 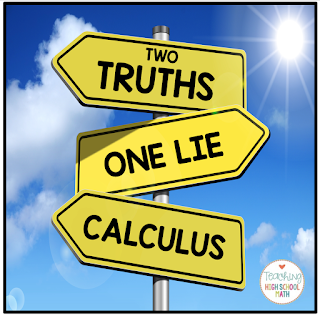 I decided to give my students an equation to work with. This way, I could target a couple of groups with some more difficult equations. But, you could easily just tell students they have to come up with their own equation. I told students they need to use words like maximum, minimum, increasing, decreasing, concave up, concave down, and point of inflection in their 3 statements. 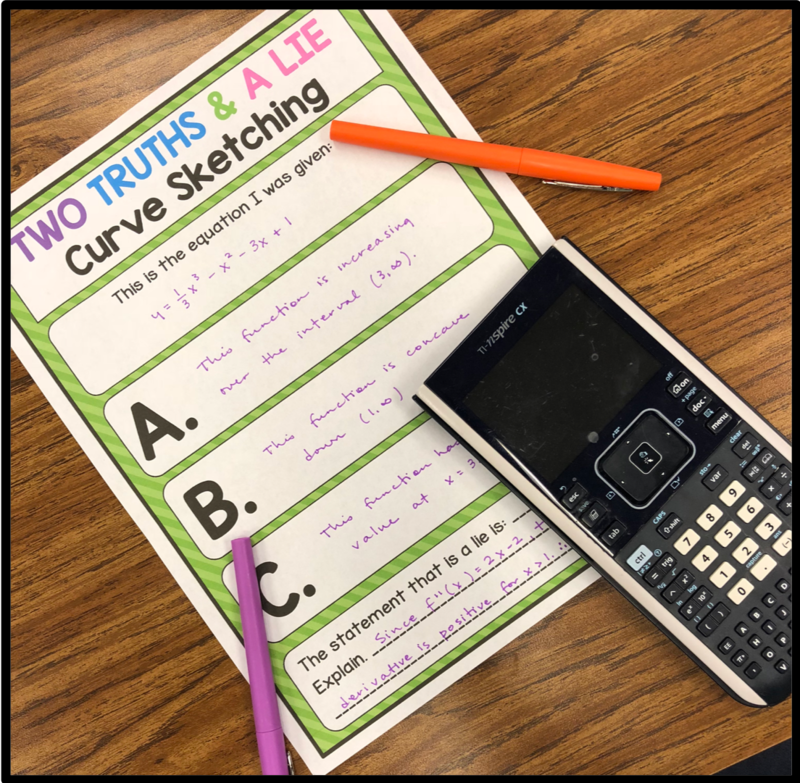 I did allow students to use their calculators to check their work. Finally, after each group was finished, I had them fold up the bottom of their paper so other students couldn't see it. We had a gallery walk around the room and students had to identify the lie on all of the other group's papers. This was a really fun activity and I hope to incorporate this activity into other topics in some of my other classes! I don't know about you, but I have a ton of post its sitting around everywhere. Every color and size...I even purchased the Post Its Teacher Treasure Box :) I use them often! 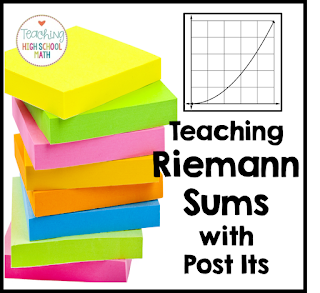 I was ready to start teaching Riemann Sums in Calculus the other day and I happened to look down at the post its I had on my desk and I realized...hey I can use these! 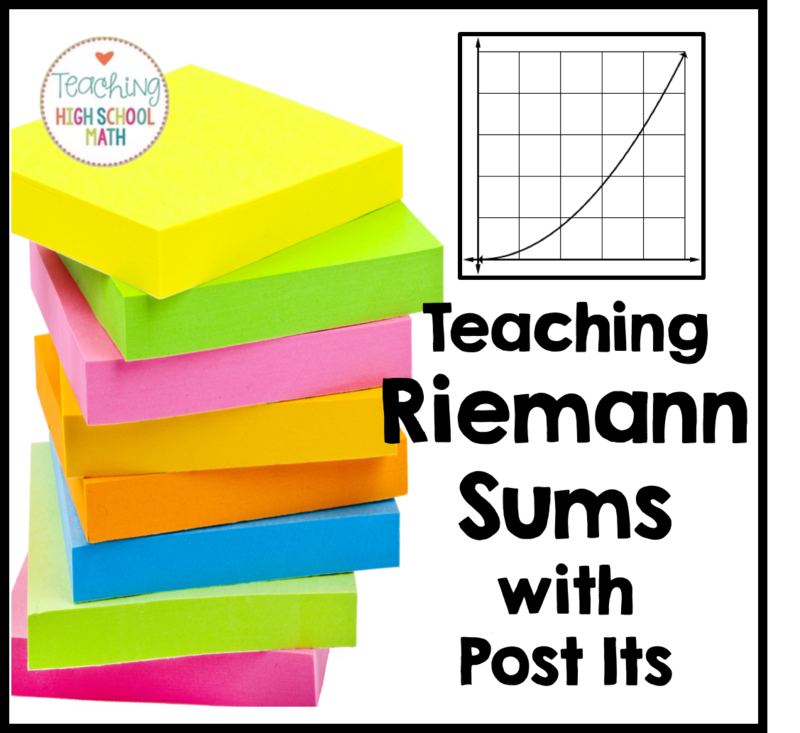 I introduced the idea of Riemann Sums to the class and we did an example at the board. Then I had everyone take 15 post it page markers. 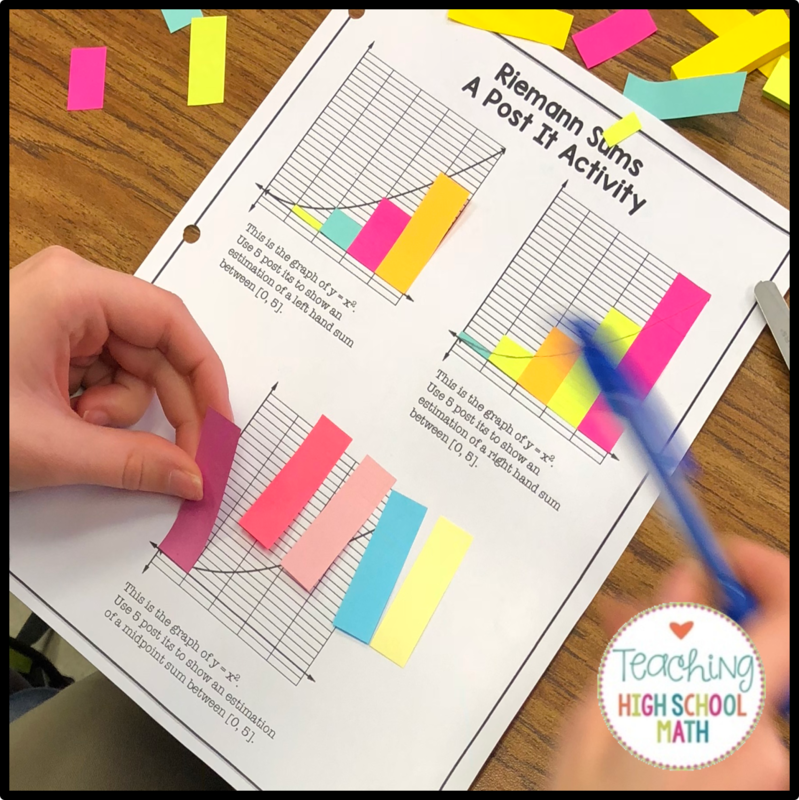 [Teacher Tip: If you put 15 post its on each student's paper before you start this activity, it takes a LOT less time] Students will also need a pair of scissors. This is how one student's paper looked as she worked on the assignment.